Axon Communications: Pharma marketing's best-kept secret? Axon's Miranda Dini and Sam Barnes tell PRWeek that its big-network refugees have afforded the agency a core stability of the kind clients may struggle to find elsewhere. 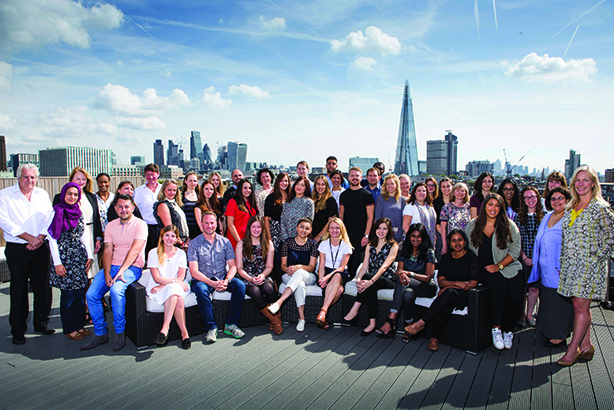 In 2017’s PRWeek UK Top 150 Axon Communications joined the select group of agencies with UK revenues in excess of £10m. Its 39 per cent growth was no mean feat – among the top 40 on the list, only Freuds (29 per cent) achieved a remotely similar upturn. Yet the agency is not on the radar of many in the PR world – its sister firm Madano, which is less than half its size, is perhaps better known across the industry. "We’re one of the best-kept secrets around," says American Miranda Dini (pictured, right), managing partner of Axon’s 74-strong London base, who is also responsible for its two small European offices. Being located in Richmond until mid-2015 may have contributed to that low profile. Ralph Sutton, a Burson-Marsteller veteran of 15 years, set up the firm for its Canadian parent, National Public Relations, in 2003, working from his dining table in the London suburb. Control passed to Dini in 2011, two years after her arrival at the firm. 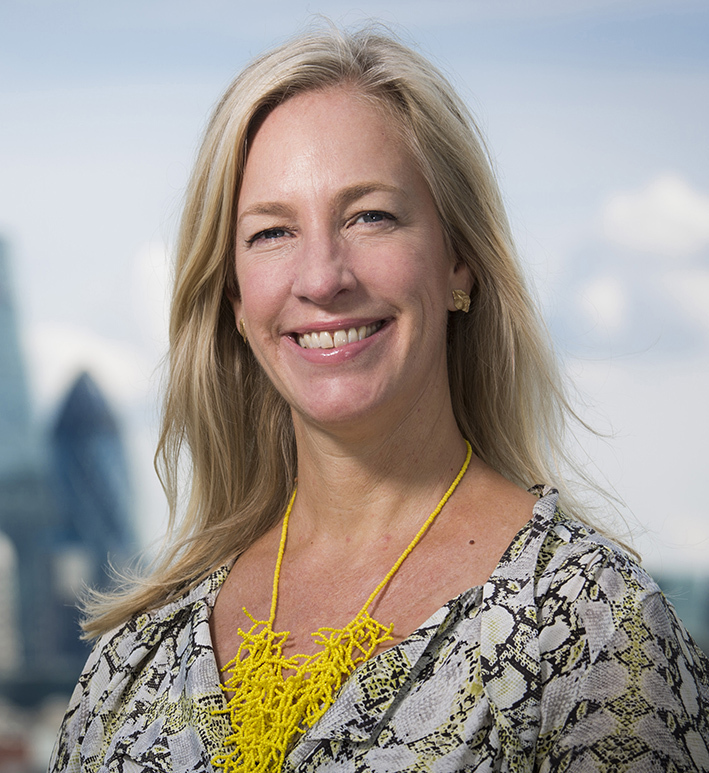 Sutton remains with National Public Relations in a global role; Axon has now moved to Southwark. 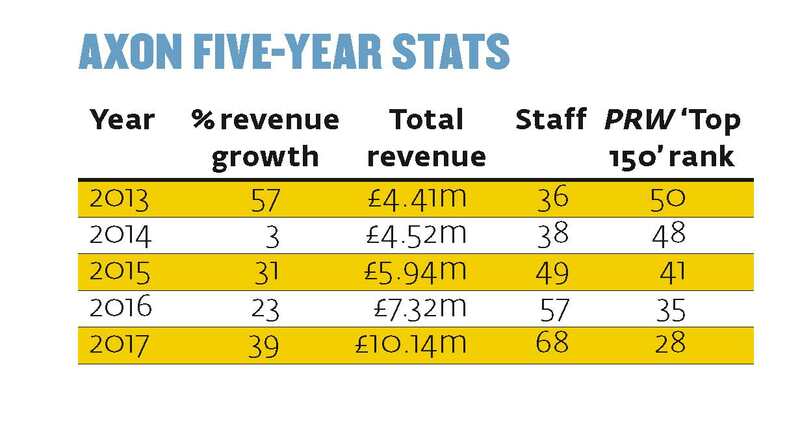 Low staff- and client-turnover is probably another reason for Axon remaining relatively off-radar. One of its top UK executives is Sam Barnes, director and head of the agency’s UK PR stream, who joined seven years ago. Several leadership team members, including finance director Andy Monk, who also works for Madano, have been with Axon a decade. Of more than 70 employees in London, just three have left the firm in 2017 to date. Some clients date back to the days of Sutton’s dining table set-up. Dini says with a warm laugh: "We’re in a sweet spot right now, where we’re building on the longevity of our clients, of our staff and of our senior team. "Virtually all of our senior team, with the exception of the folks we hired last year, have been here for five years, some much longer. We have clients we’ve worked with for 15 years." Across pharma marketing, agencies find clients reluctant to name them, let alone shout about their work. This is a consequence of tough external regulation – tougher, arguably, than those relating to any other PR discipline – and internal compliance. While these exist for good reasons, they can also serve to mean the rest of the PR industry often does not understand the breadth and complexity of the healthcare comms world. Although Dini says Axon works with four of the world’s 10 largest pharma firms as well as several other pharma and device companies and advocacy groups, she declines to name its other clients, save for two non-profit groups. They are fishing sustainability programme the Global Salmon Initiative, and cancer body European Head and Neck Society, for which Axon runs annual awareness campaign Make Sense. This can be frustrating. "We see individual patient cases of fantastic results... but ethically we can’t communicate [about] that one patient, because [they are] not representative," says Barnes. Perversely, of course, many in the industry see healthcare comms as prone to unethical practice. Barnes disagrees: "It’s so tough. Some of the campaigns we work on, honestly, press releases can go through 20, 30 people because they’re really concerned about fair balance and being legally correct. At the end of the day, what comes out can be a bit more vanilla than at the start." are interpreting some of [the regulation] a bit too strictly," she says. She also argues that the industry this side of the Atlantic is behind the US in its efforts to stand up for itself – big pharma saves plenty of lives, yet still faces plenty of flak and public suspicion. "Europe is late to the party. In the US, pharma groups like PhRMA have been trying to defend the reputation of the industry", she says, although adds a caveat by noting it is not clear how successful that has been. "We need better awareness among the public of the 10 to 12 years it takes to take a drug to market, the types of challenges they face, the patent expiries and so on," she adds. Not that everything is rosy over the Atlantic. Barnes notes a rise in questions being asked of US drugmakers about the price of new drugs, prompted by influencers ranging from the Institute for Clinical and Economic Review to politicians such as Bernie Sanders. Barnes says: "This is now becoming a concern for pharma companies in the US. In Europe we’ve been grappling with it a little bit longer." Another concern for the industry sits in the White House. Barnes says US journalists are becoming less likely to cover Food and Drug Administration approvals, with reporters driven to focusing on the executive. "If Trump tweets something on a certain day and you are trying to pitch a story for a major pharma company, that can have a huge impact. We were analysing this for a client and there’s something like a third less coverage for major pharma companies in the Trump era." That’s not all. "Clients are asking what are we going to do if Trump tweets about one of our drugs," Barnes continues. Now to the other political bombshell of 2016 – Brexit. "I think what we are seeing is clients deciding it’s not worth it for them to pursue a launch in the UK – but we don’t do much UK business, so that doesn’t affect us much," says Dini. Of the work the agency does, all but about 10 per cent is multi-market, crossing international borders. Dini’s purview includes offices in Copenhagen and Swiss pharma hub Zug – the latter announced soon after the Brexit vote, although it had been in the planning for more than two years. "We are looking to continue to grow throughout Europe. We’re looking at where the next appropriate spot might be, whether it’s Brussels or perhaps Ireland. Who knows?" she says. Another commitment the managing partner makes is that the firm will always "stay true to our core – which is the science". More than 30 of her staff including several directors (medical comms stream lead Andrew Grigg among them) hold doctorates. "If you outsource your medical insights, as a lot of agencies do, you just never quite get it," she says – and is scathing of agencies who simply "wheel out" a freelancer for pitches, never to be seen again by clients. Barnes and Dini talk about Axon retaining a "family feel", although Dini acknowledges this is "frankly bloody hard to maintain with this many people – joking that is "a very large, potentially dysfunctional family". Both argue that being part of a smaller network allows a more flexible, familiar and less bureaucratic environment than at larger networks. Dini describes how, ahead of a summer teambuilding day to London Zoo, senior staff spent "hours, and I mean hours" deciding which staff would be on a team with or sit next to each other at dinner, to ensure people mixed and broke out from the usual office relationships. Barnes relates how he called a Toronto colleague to ask for help plugging a gap before a new recruit started work. "They made it happen – literally from the start of that conversation and the person coming over [from Canada], was three weeks and they stayed for four months. It was not about who is going to pay or setting up a purchase order – you do not see that in the networks." Adds Dini: "We joke that we are big network refugees. Virtually every single member of my senior team has worked at a big network and has been burned there and does not want that any more. We feel like a bit of a boutique firm, even though we’re probably too large to be considered a boutique." Axon is not the first larger firm to make claims about retaining its start-up vibe – and it almost certainly will not be the last. But its results show that whatever it is doing, the organisation is a model of good health. Axon is part of National Public Relations, which has several offices across Canada under its own brand and owns investor relations specialist National Equicom, US integrated agency Shift Communications and Axon’s London neighbour, Madano. National is in turn owned by Res Publica Consulting Group, which also owns Cohn & Wolfe|Canada.